Yup, were beating this re-re-re-re-boot dead horse one... more... time. 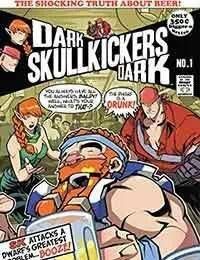 DARK SKULLKICKERS DARK - its the comic the industry needs, it just doesnt know it yet! Our fourth story arc ends and darkness begins! Secrets are revealed, continuity is poked and, of course, violence is unleashed.